All action movie and game lovers have watched and played “Hitman” will appreciate this game. It is a game about a child who is taught how to be a lethal assassin and grows up to find that all what he believed in was a lie and revolts against the organization that raised him. The game was so popular that it was later adopted into a movie that had the same name. Microgaming has decided to adopt this game/movie and transform it into a slot machine that online players can enjoy. This game is a 5-reeled video slot with fifteen winning lines that players can place their wanted bets on. 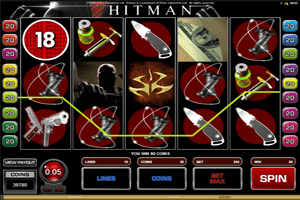 These bets are placed at the bottom through the different betting options that the Hitman slot has. The symbols are all inspired by the theme of the game, this is why the icons that appear spinning include the hitman, his famous guns, a nylon wire, a switchblade, a sniper rifle, a dollar bill and other tools that the Hitman uses in his missions. Of course, being a Microgaming slot means that it has plenty of special symbols. These symbols include the Insignia symbol which can trigger the insignia bonus. This bonus can reward players with up to 6000 coins. The Red 18 symbol is the free spins symbol that can trigger up to 18 spins with a 2x multiplier when 3 of them land anywhere on the reels of the game during the normal game mode.